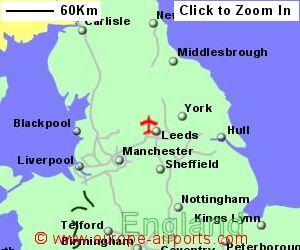 There are express coach connections between the airport and the cities of Leeds and Bradford, both cities having railway stations. There are also bus connections to York and Harrogate. Taxis can be booked in advance online, with the journey into Leeds costing approximately 20 pounds, or 30 pounds to Harrogate. Leeds Bradford airport has 6 bars/cafes/restaurants, 3 shops, currency exchange, 2 executive lounges, childrens play area, and WiFi Internet access (FREE of charge for 30 minutes). 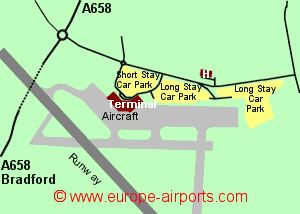 A Travelodge Hotel is located opposite the long stay car park, 400m from the terminal building. 4 million passengers were handled by Leeds Bradford airport in 2017, a 13% increase from the previous year.